This is the time of year when everyone goes nuts trying to reboot. I am one of those crazies right now. My cookie consumption reached new highs over the holidays and I am looking for solutions. 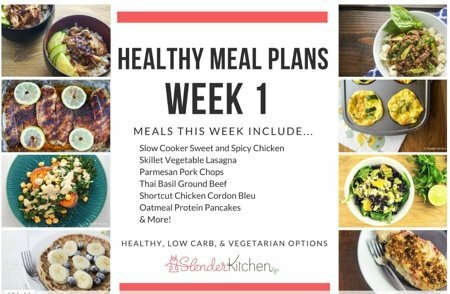 My friend, Kristen, came up with one that works -Slender Kitchen Meal Plans. 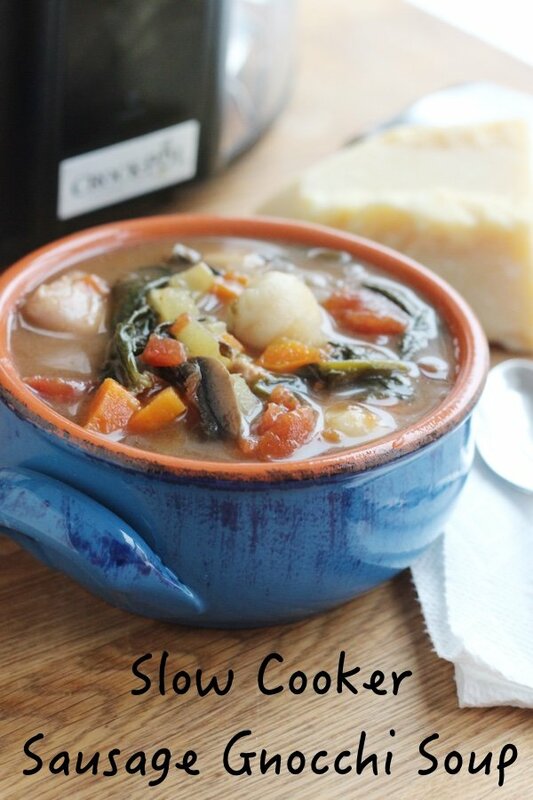 Below you will find her Slow Cooker Sausage Gnocchi soup recipe which I am eating to help clear the butter out of my veins – it is packed with vegetables. Cooking for yourself will be the key to any healthy eating plan that you come up with for 2017. Every time I get off the wagon (take-out, restaurants, munching on junk), I am amazed at how crappy I feel and how the pounds pack on. The key to eating well is COOKING. The meal plan concept is simple and powerful. Every week, she sends you a meal plan - you shop and cook the meals. The meals are healthy, easy, and have all the nutrition information (including SmartPoints for those using Weight Watchers). You can sign up here - -Slender Kitchen Meal Plans for either $8 per month or $48 for the year ($4 per month). Both subscriptions include a 14 day money back guarantee. You can go with breakfast, lunch, dinner, and snacks or you can do what I did and make 4 dinners with 6 servings each. My family of four typically takes a serving of dinner to lunch so I frequently cook more dinner than we eat for leftovers. If you don’t like a meal that Kristen has included – you can choose another recipe or add your own. You can also create your own meal plan from the large library of recipes provided. What I love about Slender Kitchen Meal Plans is that I don’t have to think. I print out the shopping list (and it is organized so my trip to the store is shorter), and cook the recipes after work throughout the week. Done. The recipes are packed with vegetables (hallelujah) so I don’t have to worry if I am cooking enough healthy options. My family has enjoyed most of the new dishes we are eating and my kids are trying more vegetables! Below is a Sunday slow cooker recipe that Kristen included in a weekly plan in December. What I loved about it was that it had mushrooms, carrots, celery, and spinach! (and my family didn’t complain). Check out Slender Kitchen Meal Plans for either $8 per month or $48 for the year ($4 per month). Both subscriptions include a 14 day money back guarantee. Snack Girl has an affiliate relationship with SlenderKitchen.com and receives a percentage of sales. 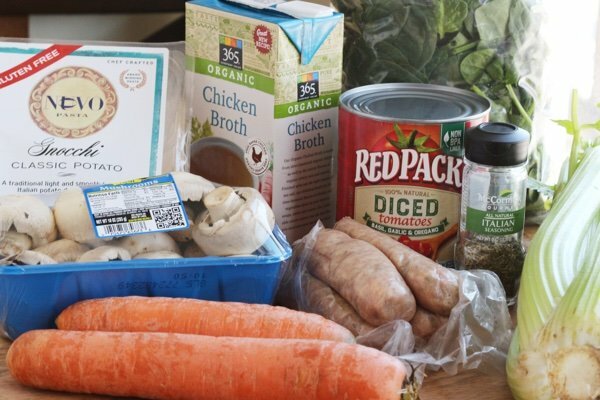 Add the sausage, onion, carrots, celery, salt, pepper, diced tomatoes, and mushrooms to a 6-quart slow cooker. Cook on low for 6 hours. For the last hour, add the spinach and gnocchi. Serve with chopped fresh parsley and Parmesan cheese. Sounds great. Any suggestions for a vegetarian option? I love her meal plans. I have been using her plans for about 6mo now. It has loads of customization options for all. @Regina - you can choose vegetarian as an option on Slender Kitchen. Thanks for your question! This sounds really wonderful but would I use the vegetarian option for diabetic? @annie - Great question! I think the low carb option would be the best for a diabetic. If a recipe is in the plan that doesn't work for you - you can always swap it for a lower sugar option. What would be the Smart points value if I didn't use the gnocchi? Sounds good but the sodium is so high. We can't have a lot of sodium. What could we leave out? Can these recipes be adapted for a gluten free diet? @Christine - you can do gluten-free in Slender Kitchen - she has a bunch of gluten-free recipes to choose from. @Lynda - drop the salt and half the chicken. Sausage always has a ton of salt in it. Thanks for all the great questions! Keep them coming! I've not tried the Slender Kitchen meal plans, but, I've gotta tell you, her recipes are wonderful! Some of my favorites. Slender Kitchen and Snack-Girl are my two favorite food websites! With the coupon code... it is $36 for the year! I am going to give it a try. We need some healthy eating help. Anyone have any go to choices for their kids? do you use fresh gnocchi or if you get frozen do you cook it first? I signed up for the year. Good deal and almost anything Snack Girl recommends is great. I just came off a few years with WW and liked the plan. Now at my goal weight, I cancelled. But WW was so easy! Great app, regular recipe ideas, etc. I figured I would try this in order to maintain and increase healthy eating. But it is FAR too much work! No app, you need to sign in on line to organize meal plan, shopping list etc. Cumbersome, not helpful. Sure good recipes, some of them at least, but there are far easier ways to find these at no cost and less hassle. No stars from me. @Regina - Thank you for your feedback. I, too, spent some time figuring out the website and how best to use the meal plans. I agree that it is a bit cumbersome but I found that after I made it past the learning curve - it works for me. Thanks for trying it! Definately curious ! Just the two of us - one needs to gain, one lose a little (?) would love to see some trial menues if poss - soubds what I'm looking for - just want to peek before I committ ! Thanking you! I have been using the website for about a month. My family likes most of the meals I have tried, I like that I can adjust the quantity I want to make, just wish all of the recipes had pictures so when I print them to put in my book and put where I cook, I can see what it is quickly. Slender Kitchen has some great recipes! Her meal planner is great and pretty easy to use. Some weeks I think, nah I'm not going to try that recipe, but then I try it and am very pleased. WW Freestyle points are included. I think it's a good value. I originally found out abut SK from a comment on Snack-Girl, now it is one of my few "go-to" food websites.